Fibroids are common, benign tumors present in 70% of women, often presenting with symptoms such as difficult urination, excessive bleeding and pain. There are several types of treatment options for fibroids, from non-invasive MRI-Guided Focused Ultrasound (MRgFUS), minimally invasive options such as Uterine Fibroid Embolization (UFE) and surgical options. At the Fibroid Center, our multispecialty team of gynecologists, surgeons and interventional radiologists complete a thorough patient evaluation to arrive at the most minimally invasive treatment option that is best suited for the patient. The Fibroid Center also treats other conditions such as varicose veins and peripheral vascular disease among others. Your care team includes gynecologists, radiologists and interventional radiologists. In a single clinic visit, these specialists will obtain a medical history, perform a gynecologic exam, and review MR imaging of the pelvis. With this approach, our team will be able to discuss all treatment options, and help our patient arrive at the treatment choice that is best for her. We provide advanced treatment options for women with fibroids, including interventional radiology techniques and surgical procedures. Learn more about fibroid treatments. Fibroids are common benign tumors. Many women who have fibroids experience no symptoms, and doctors only find the fibroids during a routine examination. We also treat other conditions, such as varicose veins and peripheral vascular disease. Learn more about conditions treated at the Fibroid Center. Be prepared for your appointment at the Fibroid Center. Learn more about what to expect at our Fibroid Center. You can also watch educational videos in our Fibroid Center video library. 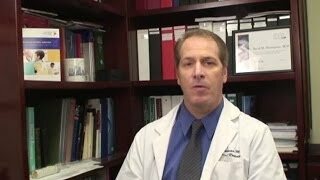 David Hovsepian, MD, discusses uterine fibroid embolization. Some patients may self-refer for consultation appointments. Please call us if you're unsure if a physician referral is required. For imaging tests done at another facility, please have contact information available when you schedule your appointment. For lab tests done at another hospital, please fax results to us prior to your appointment. Bring your completed New Patient Intake/Self-Referral Form and New Patient History Form or your Return Patient Medical History & Demographics Update form. Bring your insurance card and contact information for your referring physician, primary care provider, and any other doctors you would like us to stay in contact with regarding your care. Our requested images and lab testing is listed below; however, we are happy to help coordinate this testing when appropriate. For non-urgent consults (1–2 days) fax a referral to the IR Nurse Coordinator at 650-736-7734. You may also call us at 650-498-1108. To request an appointment, call 650-498-1108.